UC Browser has reported a record consumption of football-related content during the recently concluded FIFA World Cup 2018 in Russia, grossing over a 100 million page views. The data has been revealed by Alibaba-owned Chinese mobile internet company UCWeb and Paytm. The joint report by the two parties further reveals the online buying consumption pattern in addition to content consumption behaviour. It also establishes the fact that video remains one of the most popular formats of content consumption on the UC platform. According to the report, video content consumption witnessed a surge with 1.5 lakhs hour (equivalent to the time span of 17 years) of video watching during the recently concluded FIFA World Cup 2018. 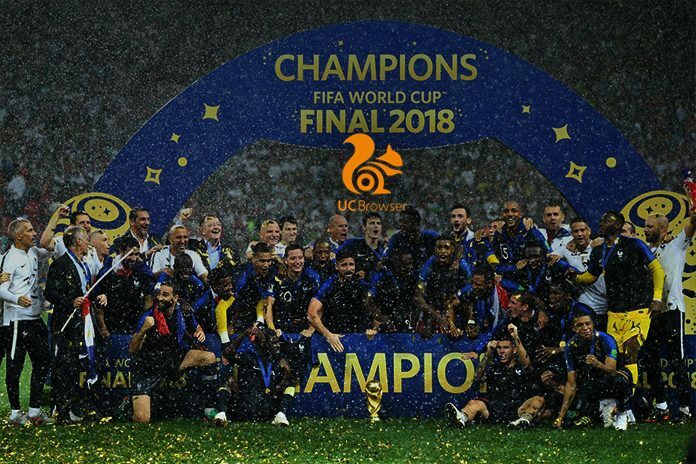 Despite the gigantic accumulated video viewership on football, IPL is still the most popular sports tournament leading with a popularity index of 420 million over FIFA World Cup which is at 320 million. UC Platform witnessed maximum traction from the cities of Kolkata, Chennai, Bangalore, Pune, and Guwahati. France vs Argentina was the most watched match of the World Cup and England emerged as the most popular team of FIFA World Cup 2018, followed by Argentina and Russia. Cristiano Ronaldo, who recently moved to Juventus from Real Madrid, remains the most popular player, with a popularity index of over 5.6 million. The Portuguese star is ahead of Lionel Messi, Neymar, Harry Kane, and Mohamed Salah. The top 3 most popular topics which highlight the World Cup content consumption were, France vs Croatia (Final Match) followed by Argentina vs France (Qualifier) and Messi, Cristiano Ronaldo. Sportzwiki emerged to be the most influential media in World Cup coverage with an influence index of 1.7 lakh, followed by Today’s Trends and Cricket Fever. At the same time, Cricket fever, Punjab Kesari, and Jagran respectively came out to be the top 3 consumed media. According to the Paytm consumption data during the world cup, Drinks and Beverages were one of the most consumed product categories among football watchers, who spent time in front of TVs while consuming more beverages. Drink and Beverages category received the biggest rise in sales as compared to the previous month before the World Cup. For binge eating, most people preferred healthy snacking option this year with Almonds and Cashews topping the list of bestselling snacks. Also, other top categories included Body care, Dairy products, Home cleaning and Cooking Essentials. The city of Delhi bought maximum from Paytm during the World Cup.